Hi there, I’m Nicole. I live in Melbourne with my husband and I’m a stay at home mum of two young girls, Kate & Megan. Previously I was a graphic designer working for a marketing company in Melbourne. After I had my second child I knew I had to find a new creative outlet. After much thought, sewing it was. Many of my handmade items are New, Retro or Vintage. I try to upcycle/recycle/repurpose where I can to create an unique item - usually One Of A Kind. OOAK. I also love fabric, buttons, ribbons & wonderful vintage crafty finds! My biggest love is floral vintage fabrics and vintage tea towels! Inspiration is from everywhere actually! Anything can inspire me, it can be certain colours, shapes & forms, etc. I mostly sew, but enjoy almost anything creative. I LOVE to use colour! The biggest part of the creative process is getting inspired by the colours & patterns of fabric. The combinations of fabrics I collect (especially the vintage florals) inspire new bunting designs. For example: once I know what fabrics I want to use, I can usually visualise how it will look before it’s finished. My favorite items to make are my vintage bunting & aprons. I decided to make them because I wanted to make something that was unique & special. It’s my unique approach to ‘My point of difference of style’ that sets my store apart from others and this keeps me inspired to create more of what I love. I always crafted as a child, I knew that crafting was my destiny in life. I was a graphic designer before I had my girls (at uni I dabbled in many creative subjects: Painting, Printmaking, Ceramics, Photography, Sculpture, Drawing, etc). 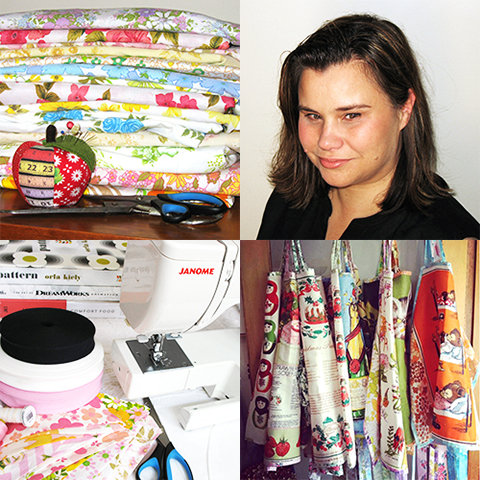 It was late 2010 when I started to sew aprons - a few months later it was bunting. I was given my grandmother’s (rather new but basic) Janome, I had not touched a sewing machine since I was at high school – yes, it had been about 25 years!!! Merry-Go-Round evokes feelings of a great childhood, a playground of fun and laughter but for me it also means.. a 'rotating platform' (so to speak) of quality handmade items that are displayed for sale. I have not done any classes/courses etc in recent times but many years ago I did a Mosaics course which I loved. I think creative blogs, Pinterest, etc can be helpful for inspiration. · Success doesn't happen overnight. · Time Management! I’m still trying to balance crafting time & family time. It’s not always easy. · Love what you do, crafting should never be about making lots of money – meaning large profits. If you only have this in mind you could be disappointed. · Have a clear idea of what your brand/label's about, or what your point of difference is. Know your target market. · Sell great products. Sell what you love and believe in then people will take notice. · Try to photograph you items on a white background where possible. · Know your design style and your point of difference. Be ‘your Original Best’ - Do not borrow ideas, be a step ahead & wonderfully different/ ‘stand out from the crowd’ so you WILL be discovered - buyers will pay for something unique & special. · Be prepared to listen to advice from other sellers. We can all do things to improve our products & store. The more professional we look - the more likely we will get a sale. · Buyers need to ‘fall in love’ with your item to buy, try to describe your products well, show that you are passionate about what you do. · Use highly descriptive ‘key words’ to describe your item in the item title. · Fill up ‘at least the first page’ of your store, I think its best to aim for two - three pages if possible. · A great logo is important and should ideally reflect what you do. It shows that you want to look professional & you are serious about what you do. · Work hard and be true to yourself, follow your own path. Do not copy others. · Great customer service. A handwritten note is good. Prompt postage is required. · Market & promote your Madeit store & items on your Facebook page & Blog (maybe Twitter & Pinterest). · Remember, Google images from a blog, rank high in a search. · Take advantage of the ‘Madeit sellers sales, offers and shop news ‘Facebook page. · Use Instagram to promote your items & store. I think Instagram will become bigger that Facebook very soon for promoting and marketing. · Success means different things to different people. For me, it is not just about crafting it’s about marketing your product well (& creating a great service). I’m certainly no expert and I’m constantly learning all the time – basically, learn from your mistakes however small. Spending time with my girls, catching up with friends, I like to do a few markets a year as I also like the social aspect. I like a weekly op shop & I’m happy to potter in the garden too. My list would be wide & varied and probably would not reflect who I am or what I’m about so I’ll simply list some of my favourite things! I love all things arty, crafty and divine. Babushka Russian dolls, buttons, ribbons, cupcakes, well made beautiful items also craft and handmade items, Craft and Design Markets such as Big Design Market and Finders Keepers, Cavallini Co stationery including Rubber Stamps, websites such as MadeIt and Flickr, British Blue Cats, Christmas, Gardening plants such as Succulents, Lavender, Roses, Butterflies and Dragonflies, Mosaics and Gaudi, Fornasetti faces and plates, anything Orla Kiely, Gisela Graham Christmas Ornaments, Liberty Of London print fabrics and Vintage florals, Beach related items - Seahorses - Starfish etc, Maileg Pixies and Rabbits, anything Aardman Studios, Pixar Studios Movies, Coffee, Lindt Chocolate, Wine and Wineries, Melbourne - Australia. Perfect weather - 25 degrees, A relaxing lunch with my husband at a winery with views of the vines, rolling hills, etc. There are too many! Retrofied, OSHA Handmade, flotsam and jetsum - Why? Creative, clever, upcycled, repurposed, fun, unique, OOAK.